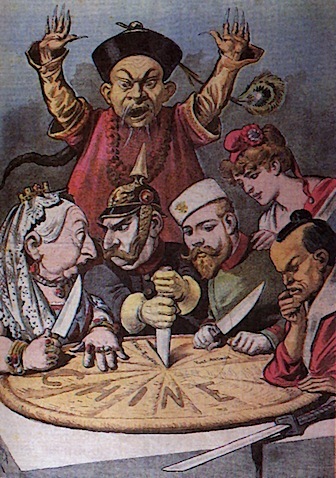 As the Qing Dynasty was crumbling and the Chinese people were at war with themselves, foreign powers swooped in to divide up the spoils, effectively dividing up the country. There were more than 80 treaty ports established in China – both on the Pacific and on major inland waterways. This is a map of the foreign enclaves that were established at the time, but does not yet included all 80 of the treaty ports. The important lesson to learn here is that when you here about some of the colonies that were in China, you perhaps think of Hong Kong and Shanghai, but looking at just this partial map should help you see (as it did me) the extent of the colonization prior to the establishment of the People’s Republic of China. RUSSIA: Parts of Liaoning and Shandong Province. The Treaty of Nanjing signaled the end of the First Opium War between the British Empire and Qing Dynasty. The treaty was signed and negotiated aboard the British gunship HMS Cornwallis while anchored at Nanjing. In addition, the island of Hong Kong was made a crown colony, ceding it to the British Queen “in perpetuity”. In 1860 the colony was extended with the Kowloon peninsula and in 1898 the colony was given a 99 year lease of the New Territories. The Treaty of Tianjin, signed at the end of the Second Opium War opened 10 more chinese ports of foreign trade including: Niuzhuang, Danshui, Hankou and Nanjing. It also opened the Yangze River to free navigation by foreigners, and secured the right of foreigners to travel freely to the internal regions of China. In short, the Qing Dynasty was very weak in the 1850-1900 time period, and foreign powers exploited that for their own gain. I got this website from my friend who shared with me regarding this website and at the moment this time I am browsing this website and reading very informative posts here. Somebody essentially assist to make critically articles I might state. That is the first time I frequented your website page and up to now? I surprised with the research you made to create this particular submit incredible. Wonderful process! 5 months of FREE Web Hosting! Sverige apotek malmö, http://natalie.pierotti.org.uk/wp-content/uploads/apotek/benzac.html , köpa säkert online.